When it’s running – and only when it’s running – it displays an ID and password. Tell me these and I can connect to your PC, see what’s on the screen, move the mouse pointer, and type things just as you can. You can see what I’m doing, and can cut me off at any time by closing the TeamViewer program. When the TeamViewer program isn’t running, I can’t access your PC, and each time you run it, it generates a new password, which you have to tell me each time. So I need your knowledge and consent each time I access your PC, and you can always see what I’m doing. 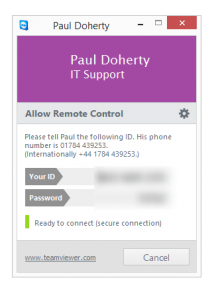 Download my TeamView “QuickSupport” program here.